Alopecia X is an inherited condition that affects Pomeranians resulting in mild to severe hair loss. Alopecia X is also regularly referred to as Black Skin Disease (BSD) as the affected areas where skin becomes exposed to sunlight typically can become quite darkened. Alopecia is the general term for coat loss however the use of the "X" signifies that it is coat loss of unknown origin as Alopecia X is a diagnosis by exclusion, ie all other typical known causes of coat loss have been tested and excluded such as thyroid dysfunction, adrenal dysfunction, skin parasites etc. The age of being affected varies however these can generally be grouped in to "early onset" and "late onset". The former is generally associated with puppies who have large volumes of cottonish looking coats, quite often greyish colour (except head and legs), which do not cycle the puppy coat through 4-8 months and they become affected with severe coat loss instead of growing new adult coat. In cases of late onset coat loss the puppies generally appear to go through normal coat cycles and have an apparent correct double coat until 2-4 years old or later and then suffer from coat cycle arrest and the coat loss when it occurs tends to be more gradual than early onset cases. Males are seen to be affected more often than females and all coat colours are affected. 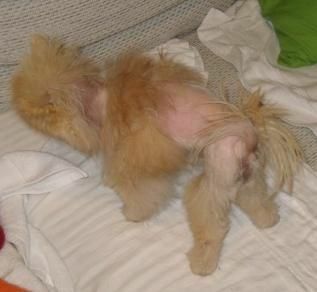 The coat loss of affected Pomeranians can range in severity however it is generally symmetrical in nature on both sides of the body and tends to start from around the base of the tail or thigh area. Progression of coat loss varies with severe cases typically having complete hair loss on the body except for the head and lower limbs. Prior to coat loss occurring the tail hair generally thins (ie not the typical large plumage of a Pomeranian) and the body coat tends to lack colour, become dull, dry, lifeless and can clump together. Other nordic/spitz breeds also have similar cases of severe coat loss however the prevalence in those breeds is less. Some affected Pomeranians may recoat spontaneously and others never recoat again. Various veterinary medications are available to assist in attempted recoating with inconsistent success and generally the coat is still abnormal even when recoated and the recoating not necessarily permanent. Affected animals should be removed from breeding programs and when neutered it can possibly lead to recoating. Poms that do recoat (with or without intervention) can again lose coat in future. Significant research has been undertaken on Alopecia X by a number of scientists however that being undertaken by the Institute of Genetics at the University of Bern in Switzerland is the most prominent. The use of recent technology advances has made the progress encouraging for this particular research activity which has funding support from the Canine Health Foundation as well as many breed clubs and breeders worldwide. Working co-operatively with breeders who share similar views in sharing progeny and/or stud services. The coat quality in our Poms is something we are very proud of, RICH VIBRANT COLOUR with correct textured double coat. We have witnessed the personal devastation this causes to owners of affected dogs and we are very aware of the consequences of the accelerated rate of proliferation overseas that has occurred through combinations of lack of awareness, ignorance, apathy, selfishness and dishonesty. Let's try to learn from that here in Australia for the benefit of our breed!